THE veterans side of Henley Rugby Club, the Henley Vultures, returned from the Jersey Super 10s Tournament last weekend as winners of both the main cup and plate trophies. This was the fourth year that the Vultures had been to the tournament, which they also won in 2016. This year saw 34 players and management make the trip, which was very much in tribute to Simon Priestley who tragically died whilst playing back in January. Priestley had been one of the leaders of the previous trips. The numbers on tour meant that the Vultures were able to field two sides, suitably named the Suckers and the Rockers and on the first day of the tournament they experienced contrasting fortunes. The Rockers, under the leadership of Mark Venner, found themselves in a tough group, and despite creating numerous chances, managed to go through three games without scoring a single point. The Suckers, with Steve Barnes in charge, breezed through their group winning all three games and only conceding one try whilst scoring more than 100 points. On finals day on Sunday the Rockers put the disappointing previous day behind them and proceeded to win both their quarter and semi-final games and ended up in the final against Old Freemen’s. The wheels appeared to have fallen off again, as the Rockers went three tries behind but up stepped Jimmy Anderson who produced an amazing 12 minutes of rugby, which saw him score four tries to help his side win the plate competition. The Suckers comfortably accounted for from Ossett in the cup quarter-final and then took revenge on Gloucestershire Police side The Thin Blue Line, who had put the Vultures out of the tournament at the semi-final stage last year, with the Suckers recording a thumping 38-0 victory. The final opponents were the RAF Vipers, who sported British Lion Alan Bateman and a couple of other former first class players in their ranks. 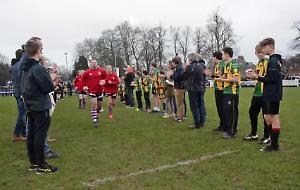 In something of a mirror of the earlier plate final, the Suckers found themselves three tries down before two tries from Will Spriggs, and then one each from former Hawks Matt Payne and Tom Allen, with the last play of the game, saw another impressive comeback to secure the Cup for the Vultures for the second time. Allen was named player of the tournament.